Lions Mane Jellyfish ; Lurking in the coves off British Columbia, Canada is the lion’s mane jellyfish. 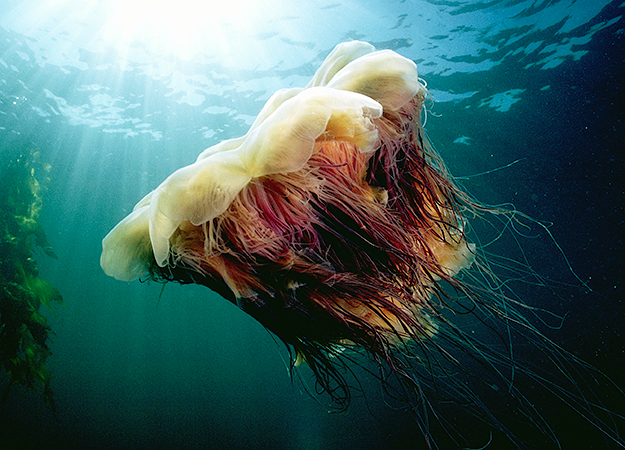 The lion’s mane uses its tentacles to pull in and eat small fish, sea creatures, and other jelly fish, such as the Aurelia. The lion’s mane can only drift with the currents, and if it drifts into the clutches of a giant anemone, a sea creature closely related to coral, and then it is helplessly reeled in by thousands of sticky tentacles before being torn apart and consumed.